Whats this?. 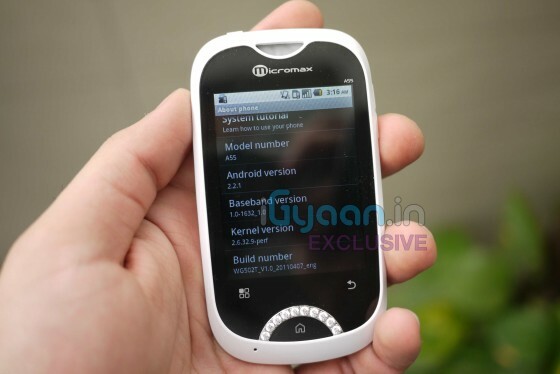 Micromax has just Launched the New Micromax Bling 2. If you have not already then please check out our exclusive Unboxing Video of the Device : HERE. In the meanwhile read the Full Press Release below. New Delhi, May 26TH, 2011: Micromax Informatics Limited (“Micromax”), which is the largest Indian domestic mobile handsets company, in terms of units shipped during the quarter ended March 31, 2010 and the third largest mobile handset seller as at March 31, 2010 (Source: IDC’s India Quarterly Mobile Handsets Tracker, 1Q 2010, June 2010 release) today unveils a new creation Bling-2, designed for the fashion-savvy women. With its glossy finish frame made with Swarovski Zirconia, the new Bling 2 has an Android 2.2 Froyo and numerous apps. To add to its design and features, Bling-2 comes in a white leather carry case enclosed with a compact mirror and special pouch to keep your lip gloss, making it easier to retouch your make -up anytime, anywhere! The phone also comes with interactive apps that would keep today’s demanding woman on their toes. Some of which are MiRoamer- Mobile radio, Saavn- Music on Demand, Mosho- Mobile shopping, Mundu Live TV (1 month free trial) and Whatsapp- a messenger that works across platforms(VAS). There’s also Micromax app store for all other requirements. With a display of 7.1 cm, and a capacitive screen, Bling2 provides features such as surfing the net, texting, sharing pictures, music, videos and more. The Bling2 also offers a Mi-Fi pocket wireless internet feature, making it personal wireless broadband connection. The phone works on both 2G and 3G networks with GSM (850/900/1800/1900MHz) and WCDMA (2100 MHz) technology. The phone comes with 3.0 MP cameras and the lens is framed in Swaroski Zirconia. The memory of the phone is expandable up to 32GB with micro SD card. The phone comes with 3.5 mm universal jack and Bluetooth connectivity. It also comes with an integrated GPS system. Micromax, is the largest Indian mobile handset company, in terms of units shipped during the quarter ended March 31, 2010 and the third largest mobile handset seller as at March 31, 2010 (Source: IDC’s India Quarterly Mobile Handsets Tracker, 1Q 2010, June 2010 release). Micromax has domestic offices across India and global presence in Hong Kong, Bangladesh, Nepal, Sri-Lanka and UAE. Disclaimer: Micromax Informatics Limited is proposing, subject to market conditions and other considerations, a public issue of its equity shares and has filed a Draft Red Herring Prospectus (“DRHP“) with the Securities and Exchange Board of India (“SEBI“). The DRHP is available on the website of SEBI at www.sebi.gov.in and the respective websites of the book running lead managers atwww.jmfinancial.in, http://www.online.citibank.co.in/rhtm/citigroupglobalscreen1.htm, www.edelcap.com and www.nomura.com/asia/services/capital_raising/equity.shtml. Investors should note that investment in equity shares involves a high degree of risk and for details relating to the same, see the section titled “Risk Factors” of the DRHP. The equity shares have not been and will not be registered under the U.S. Securities Act of 1933, as amended (“U.S. Securities Act”) or any state securities laws in the United States, and, unless so registered, may not be offered or sold within the United States except pursuant to an exemption from, or in a transaction not subject to, the registration requirements of the U.S. Securities Act and applicable state securities laws. There will be no public offering of the equity shares in the United States ” .